Cheap coach travel could be the best way to travel green! Coach travel has long been the Cinderella of travel methods. It is often seen as the preserve of the under-funded young and of retired folk living on fixed incomes. As the facts of climate change become ever clearer, it looks like this may be set to change. People are now opting for cheap coach travel because it is relatively environmentally friendly - and cheap. If you look at the Act on CO2 calculator (or most carbon calculators) for different types of travel, you will notice that coach travel comes out as the most carbon efficient. (The only thing which can beat it is a small car with five passengers). All things being equal, coach transport is as green as it gets without biking or hiking! Modern coaches are generally safe, user-friendly and fairly convenient, too. Coach travel can be surprisingly convenient, especially for direct and long-distance travel. For instance, coaches can go to places which do not have train stations and they can pick up and put off passengers at small stops along the way. Some coach routes are even able to compete on time spent travelling, because some of the routes may be more direct or accessible for the traveler. Some coach journeys have limited stops at the beginning or end of the journey with a non-stop service in between. This can give a good compromise between speed and convenience for individual travellers. Some coach companies do special hop-on hop-off deals for frequent travellers and tourists. In Australia, for example, you can travel long distances with www.ozexperience.com or other companies and visit many of the key tourist sites. Deals are available for popular routes. Most modern coaches are relatively comfortable and have air con and toilet facilities and even in-coach entertainment (not something everyone views with joy, I guess!) There are individual reading lamps and fresh air nozzles. Modern coaches are also surprisingly quiet and smooth. Gone are the days of grinding gears and stomach-churning vibrations coming from the floor. Luggage is usually stowed in large compartments under the coach and there’s room for hand luggage in overhead lockers. Some coaches can even take bikes. Coach services vary considerably around the world. Long distance travel in India, for example, often involves vehicles which are more like buses, that is there are few concessions to comfort. It's best not to indulge in long drinks before travelling as toilet stops can be few and far between! Some routes even need many of the passengers to take to the roof along with the bulky luggage and travelling livestock. Rural travel in developing countries is often of a low standard and personal safety can be an issue. Delays are also common because of poor road conditions. Some countries also have more expensive luxury coaches which travel on the more major routes and these may be far closer to western standards of service. This may still count as cheap coach travel, given the exchange rate but you may pay as much as ten times what you would pay for the standard buses used by the locals. Unfortunately, most coach services do not compare too well with rail travel for speed. With the advent of new hubs outside of city centres, this might begin to change. At the moment most coaches go right into each city destination. This can be time consuming if you just need to change to another service. For example, most cross country routes in the south of England involve going into London Victoria to change between services. Coach travel with children is perhaps not the easiest option. Changing nappies on a crowded coach is not for the faint-hearted and older children may be frustrated by the lack of space to move about. Most UK coaches allow and encourage pre-booking for coach trips and in some cases discounts are available. Booked seats are usually guaranteed, unlike in the US where Greyhound buses have been criticized for over-booking. Greyhound seats may now be reserved for an extra $5 fee. Megabus offers cheap coach travel intercity in the UK, Canada and the US and seats can be booked on-line. You can check your route on-line and find out if there are any problems with the service. Individual counties and companies vary widely with respect to pre-booking. Some booking offices may charge a hefty fee, so it may be worth checking directly with the coach company. In Europe coach travel can be a cost-effective alternative to air travel formedium length journeys, especially if you factor in airport taxes and transfer costs. Long distance coach travel is a time-consuming endeavour which does not compare too well with rail or air travel. Some coach operators are now using modern methods to cut their carbon footprints. Methods include using non-fossil fuels such as pure plant oil (PPO) (as originally used by Rudolph Diesel, almost one hundred years ago), or used cooking oil (UCO). Coaches can also be run on natural gas, electricity or even PetroAlgae, a new biofuel which is being piloted in the United States (see below for more on this). Standard fuels such as diesel are of course the most common fuels used for coach travel. In the UK over 1,6 billion miles were travelled by coach passengers in 2008. Accidents are very few and are usually caused by driver error. The popular Neoplan coaches have been involved in a few accidents but have come through investigations with their high reputation intact. In 2012 there have been accidents involving coaches which have caught a lot of media attention. The tragic accident in Sierre, Switzerland involving Belgian school children was the worst coach crash ever in Switzerland. Early indications are that it may have been caused by the driver being distracted. Clearly there are still safety lessons to be learned by drivers and coach companies. In parts of the developing world cheap coach travel cannot really be described as safe. Both roads and vehicles can be of low standard. If you are contemplating coach travel in poorer and less developed countries, do your research. The Lonely Planet guides are a good starting point. 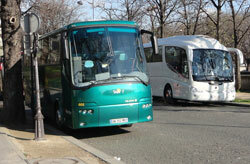 Coach companies and travel companies are helping ensure that cheap coach travel becomes even more eco-friendly. Plans are in place for carbon neutral, hybrid or bio-fuel vehicles. Whether using biofuel really makes for green coach travel is still problematic. Biofuels have the advantage of being renewable (unlike fossil fuels). Nevertheless, there are many problems with their use, as they tend to use land for growing which would otherwise be used for food production. Now there are concerns that biofuels are making food crops more expensive and this is hitting vulnerable people in the poorest parts of the world. Some biofuels have also been grown on cleared forest land. When forests are cleared to make way for crops large amounts of greenhouse gases are emitted as the carbon locked up in the forests is burnt. The one exception to this tale of woe is PetroAlgae. The system being developed by this forward-looking firm creates a fuel which can replace petrol or diesel. The starting point is microscopic algae which can be grown in vats. The process actually uses up CO2 and there are no toxic waste products. The algae can be grown using “grey water” for the most part so it looks as though there will be a bright future for this new type of fuel. Cheap coach travel certainly has a lot of appeal, especially in the current rocky economic climate. Many young people are discovering its benefits as learning to drive has become an aspiration rather than a rite of passage. Green coach travel may have a way to go but it's certainly worth a look if you are contemplating any long-distance travel!